Devices for making invisible an object are a challenge that has attracted the attention of many researchers during the last years. The basic idea consists of covering the object with an invisibility cloak that guides the waves around such object and returns them to their original shape once they have crossed the cloak. Since these waves recover their original shape as if there were no object, this mechanism confers the object with the property of being undetectable by any sensor placed in front of or behind it. Since the first proposal of an invisibility cloak for electromagnetic waves , many works have been published dealing with this topic. The principles of the cloaking phenomenon also apply to sound waves, which led to the introduction of acoustic cloaks  and whose basic operation is observed in Fig. 1. Fig. #1: (a) Sound wave traveling in free space, (b) impinging in a solid cylinder and (c) impinging in a solid cylinder surrounded by an invisibility cloak. Apart from the possible military applications, acoustic cloaking is a phenomenon that can be applied to develop structures for diverting impinging noise or new types of walls improving the acoustics in concert halls. Biomedical devices like "transparent" probes for ultrasonography and acoustic sensors that do not distort the field they are measuring are also potential applications of acoustic cloaks. However, the parameters required to build an acoustic cloak comprise materials with exotic properties that are not found in nature. Therefore the physical realization of these devices relies on the ability of designing artificial structures with the appropriate parameters , referred to in literature as metamaterials. Nevertheless, acoustic metamaterials intended to work with airborne sound cannot provide a sound speed higher than that of the surrounding air, which, on the other hand, corresponds to a condition theoretically required in order to implement a cloak. This reason limits the practical realization of acoustic cloaks for airborne sound. Therefore a physical mechanism is needed allowing the increase of the sound speed inside the metamaterials composing the cloak. Here we suggest the use of heat, since the sound speed of air increases when the temperature is higher. Our proposal consists of a set of concentric layers surrounding a central metallic cylinder, which is the object to conceal. Each layer is implemented with a set of cylinders, describing a circumference, that are heated at a specific temperature. By controlling the temperature and the quantity of cylinders at each layer, the acoustic parameters of the resulting metamaterial can be properly tailored to those needed by an invisibility cloak. Fig. 2a shows a simulation of a structure containing 2,460 cylinders distributed in 20 concentric layers . Here a wave traveling towards the right impinges on the sample. The guiding of the waves inside the cloak can be observed, although its operation is not as ideal as that found in theoretical perfect cloaks. Fig. #2: Sound wave travelling from the left to the right impinges in a rigid cylinder surrounded by a cloak based on heated cylinders. Unfortunately, this acoustic cloak is hardly realizable due to the large variation of temperature required between nearest-neighbor layers. Another procedure to achieve the concealment of an object consists of building a cloak that scatters the waves in the opposite way that such object does. In this manner both contributions cancel each other and the sound waves are undistorted outside the cloak . By following this principle, we designed a two dimensional (2D) cloak for waves having a specific frequency and traveling in a given direction. The central object is an aluminum cylinder with 22.5 cm of diameter and the cloak consists of 120 cylinders with 15 mm of diameter. The positions of these cylinders were calculated by using genetic algorithms, a calculation method inspired by Darwinian evolution. The resulting experimental sample is shown in Fig. 3a. In addition the same process could be extended to a three-dimensional (3-D) scheme, leading to the proposal of a 3-D acoustic cloak. It consists of a sphere with 4 cm of diameter surrounded by a set of concentric rings whose positions and radii were computationally obtained. A photograph of this device is shown in Fig. 3b. Fig. #3: Photographs of the fabricated structures of a 2-D (a) and 3-D (b) acoustic cloak. Both structures were experimentally tested. Fig. 4 represents the measured visibility index obtained in each case [6, 7]. This index quantifies how different the sound wavefronts are compared to those in free space. The concealment phenomenon is achieved when the visibility index of the cloaked object is reduced to values close to those of the free space. As it is shown, this effect occurs in a small band of frequencies in both structures. In order to illustrate how the acoustic fields behave in the space behind the 3-D cloak, an animation containing the measured data can be downloaded from this link. In essence, the field is approximately uniform in the case of free space, while the sphere projects a "shadow" behind it. The cloaked sphere projects a shadow that disappears at the frequencies where its visibility index is below that of the bare sphere. Fig. #4: Visibility index measured at free space, with an object and such object surrounded by a cloak for a (a) 2-D and (b) 3-D geometry. The index of free space has a low but nonzero value due to small perturbations produced by the experimental setup. Although the constructed devices work properly, they present the limitations of being one-directional and they operate in a narrow range of frequencies. This fact motivates future research in order to find more versatile devices. Pendry, J. B., Schurig, D. and Smith, D. R. (2006). "Controlling electromagnetic fields," Science 312, 1780-1782. Cummer, S. A. and Schurig, D. (2007). 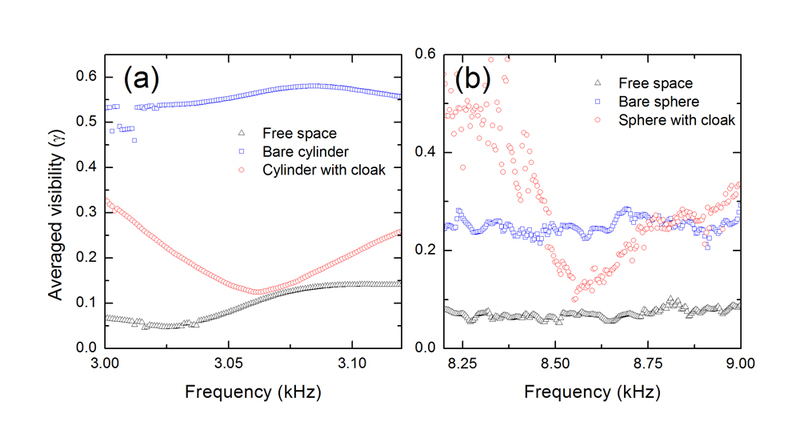 "One path to acoustic cloaking," New J. of Phys. 9, 45. Torrent, D. and Sánchez-Dehesa, J. (2008). "Acoustic cloaking in 2D: one feasible approach," New J. of Phys. 10, 063015. García-Chocano, V. M., Torrent, D. and Sánchez-Dehesa, J. (2012). "Reduced acoustic cloaks based on temperature gradients," Appl. Phys. Lett. 101, 084103. Guild, M. D., Alu, A. and Haberman, M. R. (2011). "Cancellation of acoustic scattering from an elastic sphere," J. of the Acoust. Soc. of Am. 129, 1355-1365. García-Chocano, V. M., Sanchís, L., Díaz-Rubio, A., Martínez-Pastor, J., Cervera, F., Llopis-Pontiveros, R. and Sánchez-Dehesa, J. (2011). "Acoustic cloak for airborne sound by inverse design," Appl. Phys. Lett. 99, 074102. Sanchis, L., García-Chocano, V. M., Llopis-Pontiveros, R., Climente, A., Martinez-Pastor, J., Cervera, F. and Sánchez-Dehesa, J. (2013). "Three-dimensional axisymmetric cloak based on the cancellation of acoustic scattering from a sphere," Phys. Rev. Lett. 110, 124301. Work supported by the Office of Naval Research and the Spanish Ministry of Economy and Competitiveness.